Unlike Fresno Football Club, set to debut in the USL in 2018, the Charlotte Eagles have been around since 1991. Naturally the logo might seem outdated, seeing that it's been around for more than 20 years. Now I'm not saying all logos created years ago aren't good; what I'm saying is, an effective logo should work well no matter what design era it's in. We must take a different approach while reviewing this logo. If we were to compare it to the minimalist approach a lot of logos are taking right now, they'd be polar opposites. Remember, this logo was created over 25 years ago when design was at a transitional stage. February 1990, Photoshop Version 1.0 is born; graphic design forever changes. Unlike today, Photoshop was made available to everyone as opposed to specialists. So in the 90's we see a wide variety of design, ranging from the start of grunge to the use of simple geometric shapes. Take for instance the Carolina Dynamo (also a PDL club) founded in 1993 has a very simple flat and completely different type of logo for soccer(someone let them know they need to re-brand). And of course we have the 1994 World Cup USA logo; done in a very similar fashion. Simple shapes, kind of like people were just starting to learn how to use this program. As time went on, more and more updates were being made to Photoshop. Graphic design was constantly changing, new abilities meant endless possibilities. The introduction of layers in Photoshop, skyrocketed the design world and began introducing more detailed logos. A clear example of this would be Rochester Rhinos of the United Soccer League. Created in 1996, the Rochester Rhinos logo progression shows how the evolution of design has changed in soccer logos. Having re-branded recently when new owners David and Wendy Dworkin took over, the 90's logo has been abandoned and they are now using a great looking rhino logo. However, in all honesty, the secondary logo is much better than the primary. Now that we have an sense of the design world in the 90's, we can see that many designers were just doing what was popular at the time as well as learning a new program along the way. The only problem is, their execution wasn't quite on. Being that the team is part of a the MAI organization, an organization that shares the message of Christianity through soccer, I just am really annoyed with the orange cross in the middle of the logo. In a typical cross the horizontal line is shorter than the vertical line; but here we have yet again, a generic soccer ball covering up the bottom of the cross. Here's what I think each element means. Rather than the shape resembling a cross symbolizing their Christianity, it looks more like a plus sign or a perfect four-quadrant breakup in the shield. It's important to include the cross, I feel it is more important to the team organization than the eagle aspect, I just need a little bit more creativity and distinction to reflect an actual cross. To be honest, I don't think the eagle is needed. In fact, I would rather it be removed from the logo, though still keep the name. Similar to the soccer ball approach, if you can't make it creative and something different, it's best to just leave it out. The lines in the background I'm assuming are globe or world map lines set to represent world ministry. Those too, I would just get rid of them and focus more on the other parts of the logo. The two stars can go too, which represent the championships won when they were in the professional league. Since they are now in the PDL those stars are irrelevant, but they can include one star for their recent championship win. I think if we removed the orange outline on the word EAGLES, it would stand out a bit more. I'm not the biggest fan of using two unique but similar fonts together, unless the design called for it. In this sense, I would make CHARLOTTE a simple sans-serif font, and then make EAGLES a unique font. Charlotte's color scheme is one that I can't think of another team in the PDL has right now. Blue and orange are two of my favorite colors, and with the right shades combined together, you can get a really nice palette going. Though the random orange lightning bolt in the eagle's wing has to go. I'm not sure if that's supposed to resemble feathers or some type of eagle wing feature that I'm unaware of, or the most logical explanation, it was struck by he-who-must-not-be-named. Joking. Anyways, since this logo was done very in tune with the design world at the time. I figured why not tackle this logo in a minimalist way. What's minimalist? A perfect example is Juventus. You know, the logo that pissed off everyone. But I have to agree, this was TOO SIMPLE and got rid of a very important part of Juventus club history, the badge. So I wanted to take a crack at this minimalist era that we are in and reboot the Charlotte Eagles. Check it out below and let me know what you think! As I mentioned earlier, I got rid of the generic ball and the unimportant eagle. I stripped this logo down to the main point, a championship team that has Christian values in it's foundation. I eliminated the use of black, and lightened the blue and orange shades slightly. By simplifying the Charlotte Eagles to just CE, we can now use it as a monogram, another way to expand on the brand. Overall, this logo OK for an amateur team, that most likely has a very small staff and can't afford to pay thousands for a re-brand. Though with the USL launching a D3 league, Charlotte Eagles should take advantage and re-brand, especially after winning the championship. It could show that they are ready to return to professional soccer. 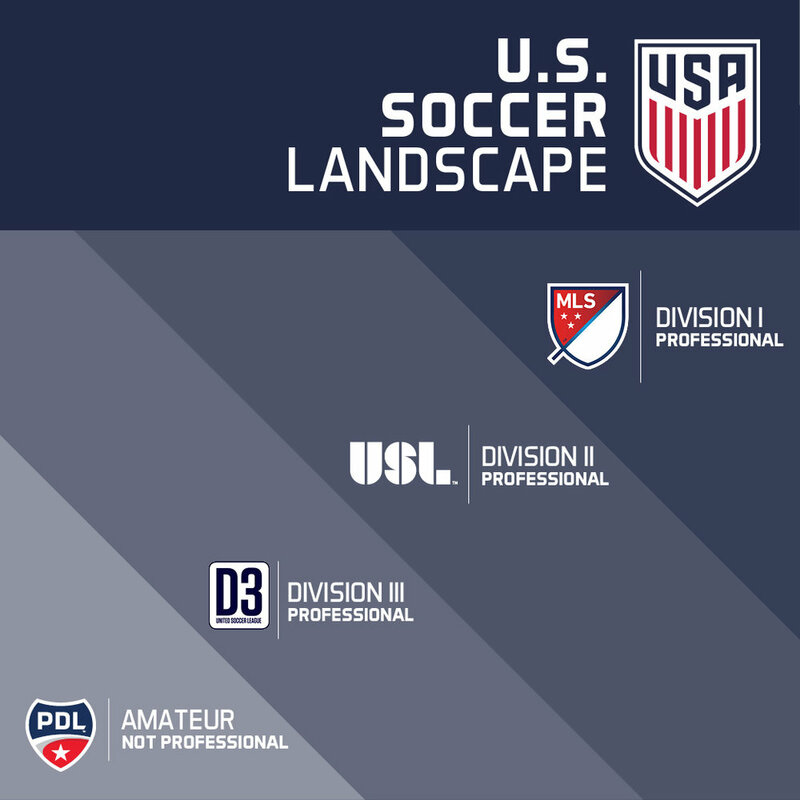 Next week I'll be looking at some more PDL, USL and MLS teams, be on a lookout for it! Originality- What makes the logo its own? Does it stand out among the rest, or blend in? They tried, but the use of a generic soccer ball and creative-lacking eagle brings the originality down. Creativity- Is there that special thing that makes it stand out? What sets it apart from the others in a special way? The symbol that should have been capitalized on but was poorly executed was the cross.